White-nose syndrome, the fungal disease that has killed millions of bats in North America, has been discovered in four new Illinois counties. Tests conducted by the U.S. Geological Survey’s National Wildlife Health Center in Madison, Wisconsin found five bats submitted from Union, Saline, Johnson, and Jackson Counties were positive for the disease. Although first discovered in Illinois in 2013, these are the first confirmed records in these counties. The disease is also present in Illinois’ Hardin, LaSalle, Monroe and Pope Counties. In an effort to protect hibernating bats, including threatened and endangered species, all Illinois Department of Natural Resources-owned or managed caves have been closed to the public since 2010. In addition, all caves within the Shawnee National Forest, managed by the U.S. Forest Service, have been formally closed since 2009. 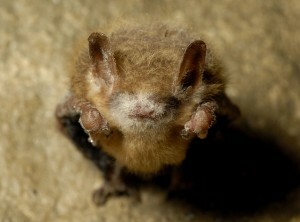 White-nose syndrome was first detected in New York State in 2006 and estimations put the death toll at more than 5.7 million cave-dwelling bats in the eastern half of North America. Bats with WNS have been confirmed in 25 states and five Canadian provinces. White-nose syndrome monitoring in Illinois is done in collaboration by the University of Illinois–Prairie Research Institute, U.S. Fish and Wildlife Service, U. S. Forest Service, and the Illinois Department of Natural Resources.